I've been meaning to do a post on Nettle since we moved here and E found a little patch of it growing down the hill. I was thrilled when he showed me. I picked it throughout the summertime and now have lots of nettle dried and tucked away for wintertime. It dries quickly and easily. I have very high regard for this herb as I think it cures (or prevents) a number of ailments as well as giving a constant source of nourishment to a body. It is full of vitamins and minerals and doles them out in a very balanced way. This year I am also making a sort of seasoning mix (a friend's idea) with a bunch of dried herbs, veg and nettle in it. We've used it in smoothies, hair rinses, the homemade dog food we make, for plant fertilizer, in smoothies, cooked in soup and on pizza (or anywhere you would use spinach). We've tried it juiced with fresh apples. Delicious...and delightfully green. I've got nettle seed salt in the cupboard. Nettle beer in the pantry. But, most importantly, to me is this most basic use - I drink a quart of nettle infusion usually every day. I know that some people don't like the taste but I credit this herb for giving me my health and energy - energy to live this life full on...the way I choose to live it - and I find now that if I miss a day or two of it when we are away that I really start to crave it. I make mine in the morning or afternoon and, once it cools, I tuck it in the fridge to enjoy the next day when it is dark green and full of goodness. The best source of information I have found on the many uses for this herb is in Susun Weed books. I am a big fan of her books (so much so that I even bought one of them new and anyone who knows me knows that That is a Big Deal!). 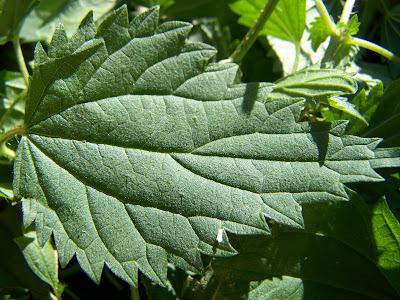 ;-) Here are a few links about the health benefits of nettle and how to prepare the infusion. I would urge everyone to give this wonderful plant a try. I haven't found any growing wild around here so I will have to consider where to plant it myself. I used dried nettle in my calcium tea, but was glad for the link with all the great information. Thanks for that! 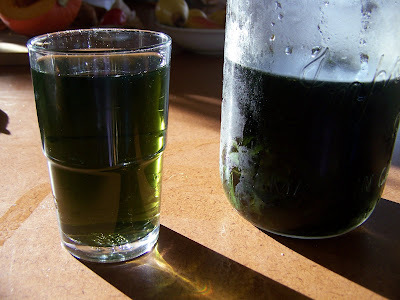 If you want to try something different with fresh nettles, try a cold maceration. 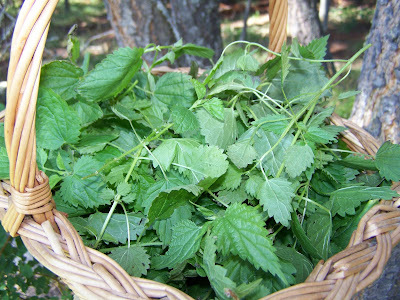 Gather your nettles, place in a large glass or plastic bowl (I use a washing up bowl) and cover with cold water. Leave overnight in a cold place. Next morning strain off the pink liquid and drink. It is full of minerals and very refreshing in warm weather. It's also very cost effective since you don't need to use any heat and you get loads of minerals! I can't tell you how I found your blog (I was looking at someone else's and saw your link), but Oh, I'm glad I found it! It's so nice to meet kindred spirits~I love herbs and foraging, too, and nettles have to be right up there with the very best! We teach our children (We have four girls and a two-year old boy) at home, too, and love it. I hope I haven't bored you too much, but I truly was inspired by coming over today. Molly, thanks for the tip. I'm going to try that to help increase the amount my boys are eating - they are not as impressed with infusion as I am. I was just talking to my friend (who introduced me to nettle) about the way you use them and she thought she would try using her "used" nettle from her daily infusion in the same way. I love that idea too. Thanks Sarah, yes I DO want to try something different with fresh nettles. I was just thinking I'd like a book 101 Ways to Use Nettle. :-) Thanks for the directions. I've never come across that way of using them. Interesting that the liquid is pink. Hi Heather, There is a real book called 101 Things to do with nettle. I don't have it, but a couple of the people who come to my workshops do and they rate it highly. Do you make spiced nettle latte for winter drinking? I got the recipe from Darcy Blue and use it when I'm giving talks to elders and others.If I can find your email addy or if you'd like to send it to me at sarah@headology.co.uk, I'll send you my nettle handout. There are lots of different nettle soup and cordial recipes on my blog as well. Thanks Sarah...now I have to see if our library will buy that book! Sounds fantastic. I've never even heard of spiced nettle latte. Would love it. I'll pop into your blog to find out more, I noticed you have all kinds of interesting photos of the things you make on your sidebar.